Description: My So-Called Biblical Life gives fresh perspectives to stories from the Bible, imbuing them with powerful, honest emotion. The editor's translation of biblical passages grounds twelve original narratives, which engage the reader and invite a personal response. Imagine sending away your precious daughter to be a concubine. Suppose your family's survival depended on the sacrifice of your brother's life. Picture Jesus looking you in the eye and telling you to sell everything you own. What would you do? The collected essays in this volume explore these scenarios and more. Readers easily learn about life in biblical times through well-researched stories with supporting footnotes. Questions follow each essay, stimulating individual reflection and group discussion, and making this book a unique resource for classes, book groups, seminars, sermons, retreats, and Bible studies. My So-Called Biblical Life transforms one-dimensional portrayals of Bible characters into vibrant portraits of men, women, and children from antiquity whose struggles and hopes still speak to us today. 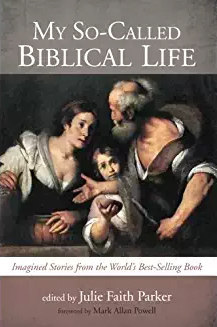 Citation: Katherine Low, review of Julie Faith Parker, ed., My So-Called Biblical Life: Imagined Stories from the World�s Best-Selling Book, Review of Biblical Literature [http://www.bookreviews.org] (2019).